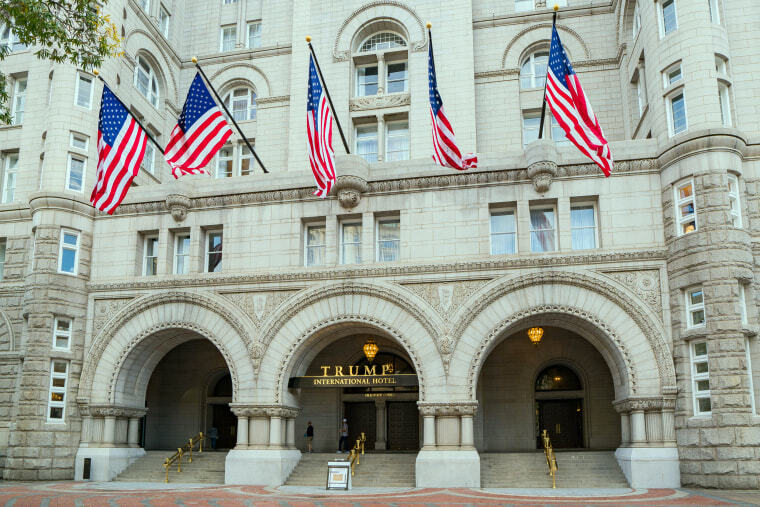 WASHINGTON — A Trump Organization executive said Monday that the company has donated profits from foreign government patrons at its hotel properties to the U.S. Treasury, but he wouldn't say how much. Executive Vice President and Chief Compliance Counsel George Sorial said in a statement that the donation was made on Feb. 22 and includes profits from Jan. 20 through Dec. 31, 2017. The company declined to provide a sum or breakdown of the amounts by country. The company touted the donation as making good on its ethics pledge to donate foreign government profits during Trump's presidency, but a watchdog group immediately criticized the organization for not providing details. Where do Trump's financial interests lie? "The refusal of both the administration and the Trump Organization to provide any details about the amount or recipients of the profits that the president promised to donate is emblematic of the secrecy with which Mr. Trump has operated both in government and in his business affairs," said Norm Eisen, chairman of the watchdog group Citizens for Responsibility and Ethics in Washington. "When you're getting sums of money from foreign governments, it raises the question of whether your decisions are motivated by those flows of funds to your own pocket book or the best interests of the United States," Eisen said. Sorial said the profits were calculated using "our policy and the Uniform System of Accounts for the Lodging Industry." The U.S. Treasury did not immediately respond to requests for comment. Watchdog group Public Citizen questioned the spirit of the pledge in a letter to the Trump Organization earlier this month since the methodology used for donations would seemingly not require any donation from unprofitable properties receiving foreign government revenue. Ethics experts had already found problems with the pledge made at a news conference before Trump's inauguration because it didn't include all his properties, such as his resorts, and left it up to Trump to define "profit." The pledge was supposedly made to ameliorate the worry that Trump was violating the Constitution's emoluments clause, which bans the president's acceptance of foreign gifts and money without Congress' permission. Trump's attorneys have challenged the premise that a hotel room is an "emolument" but announced the pledge to "do more than what the Constitution requires" by donating foreign profits at the news conference. Later, questions emerged about exactly what this would entail. An eight-page pamphlet provided by the Trump Organization to the House Oversight Committee in May said that the company planned to send the Treasury only profits obviously tied to foreign governments, and not ask guests questions about the source of their money because that would "impede upon personal privacy and diminish the guest experience of our brand." "It's bad that Trump won't divest himself and establish a truly blind trust, and it's worse that he won't be transparent," said Rep. Elijah Cummings, D-Maryland, ranking member on the House Oversight Committee. He called the Republicans refusal to do oversight, such as subpoena documents, that would shed light on Trump's conflicts of interest "unconscionable."